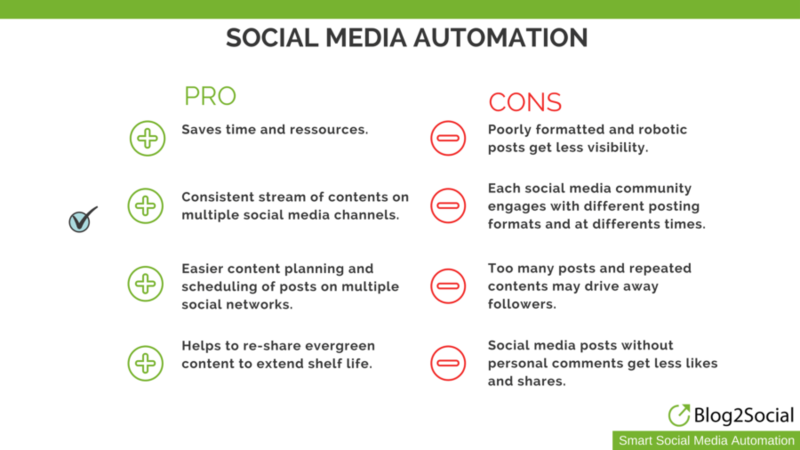 What are the Pros and Cons of Social Media Automation? With the growing number of social networks and channels, managing your social media channels can devour a lot of time and resources. Social media automation seems to be an easy way out of the hamster wheel. Social media automation tools promise to do all the work for you. The benefits of social media automation are obvious: social media automation tools can save tons of work and time. But there are also pitfalls on the way of automating your social media marketing. Deathtraps, that can turn your social news feeds into lifeless robotic streams. 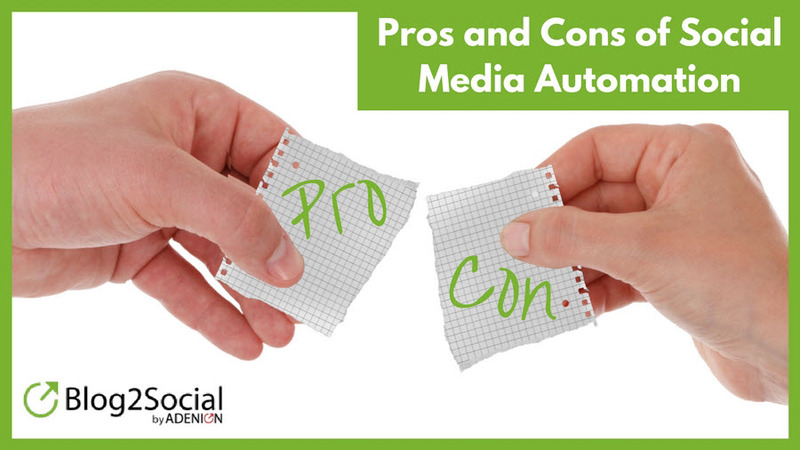 Let's take a look at the pros and cons of social media automation and how to do it right. The most obvious benefit of social media automation is the convenience and the time-saving effect. There are plenty of social media automation tools that allow you to create and schedule content to be shared at a specific time on multiple social platforms. These tools save time and resources for tedious manual tasks like filling your social channels with fresh content. Social media automation will also make it much easier to provide a consistent stream of content on multiple social channels. Scheduling your social media posts will allow you to share content even when you are out of office or on holidays. Scheduling will also help you to repeat your posts automatically and re-share your evergreen content in order to extend the lifetime of your posts. With social media automation tools, you can schedule and share your content at a specific time on multiple social platforms. This is a great help if you want to share your content on multiple social network sites or if you need a quick way to post messages to each of your channels at once. The social media tools also allow you to ensure a consistent stream of content on your channels without manually having to update your feeds constantly with new content. Consistency in content delivery helps you to keep your followers updated and loyal to your channels. Automation also allows you to deliver more content more often. It also allows you to easily repeat your posts and re-share your evergreen content regularly. Social media tools enable you to schedule your messages to be posted at a specific time, even during off office hours, holidays and vacations. This allows you to schedule your posts for the best times throughout the day when your content is most likely to make an impact. This is the time when your followers are most active and your content is most likely to be seen and engaged with. With the convenience of automation, you can save a lot of time for tedious manual work. With sharing your content automatically across multiple social platforms and communities you can reach out to more followers and potential reader in less time. Time, you can better spend on creating and researching valuable content for your audience. Number of characters for posts or comments. Size and number of images that can be posted. Text post, link post or image post formats and what works best. Favorite times when social communities are most active. Posting frequency: the number and frequency of postings that lead to more engagement or annoy the community. However, the benefit of convenience is also the biggest pitfall with social media automation. Social media automation can turn your social media channels into lifeless, robotic streams of repetitive posts. Most social media automation tools share the same content in the same format on all social media channels, regardless of their differences. However, poorly formatted posts without personal comments get less visibility and receive engagement. 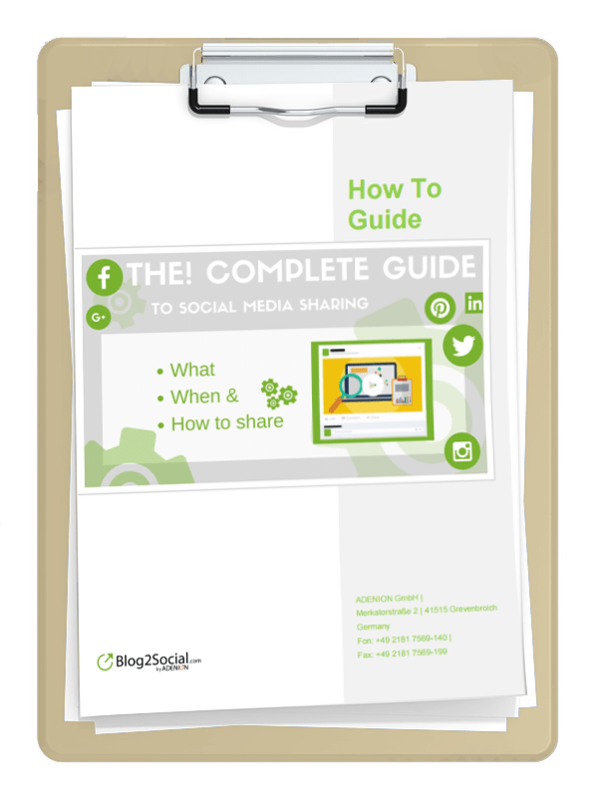 Each social platform offers different options for presenting your posts and content. And each community reacts differently to specific content and post formats. For instance, hashtags work fine for Twitter and Instagram, but they don't perform on Facebook. And while Google followers prefer longer comments, Facebook fans respond better to short ones. Automation ensures consistency in content delivery, but this can also backfire on your reputation. If you don't monitor your automated posts for their impact and response, your social streams can quickly become irrelevant to your audience. Too many repetitions of the same content can easily annoy and drive away your followers. If you don't keep track of your automated posts current events can make your scheduled posts look outdated or misplaced. Successful social media marketing is all about communication and interaction with your community. Social media automation can save you from tedious manual work. But don't let yourself be carried away by the convenience and lose contact with your audience. Automated posts without personal comments usually don't get much response. So consider very carefully what your followers in each community expect, and don't be tempted by the convenience to push all your content to every social channel in the same way. Social media automation makes it easy to re-share your posts, but don't be tempted by the convenience. Combine automated promotional posts with personal content and curated content to give your social feeds an authentic and balanced appearance and to offer your audience a variety of inspiring contents. Don't share everything everywhere. Select your social media channels carefully before you post. Always think of your audience. Only share content that is relevant to the specific community on each social platform. Even if you share the same content, always customize your comments, images and posting times to each respective social media channel. Sharing your content at different times and on different days will increase the visibility of your posts across various networks and helps to extend the lifetime of each post. Personal comments make the posts more engaging. Questions or call-for-actions in the comments encourage response and interaction with the community. Automated Replies and Direct Messages are not personalized, and your audience is unlikely to engage with them. Use the time you don't have to spend on manual sharing on social networks anymore, to engage with your social community on a personal level. There are several social media automation tools out there. Most tools help you with scheduling your social media posts. But most social media automation tools just push out the same message to all networks resulting in uniform posts that don't get much outreach and engagement. However, social media marketing is not just posting tons of posts on your accounts. Social media is active engagement with your community. Blog2Social is a tool to automate as much as possible but at the same time keep the benefits of tailoring your posts to fit each social platform and community. Blog2Social enables you to customize and schedule your posts for all your social network accounts. Customize posts for personal profiles, pages, and groups on a one-page preview editor and in a one-step workflow. Blog2Social turns your social media posts automatically into the best format for each network. Your posts will be automatically filled with pre-defined comments according to the appropriate number of characters for each network. Add personal comments, hashtags, handles or emojis to personally reach out to your community and encourage engagement. Choose between the link post and image post format for each post or community. Select the image you want to post for each social network or community individually, select any image from your gallery or device. Edit meta-tag parameters for Facebook Open Graph and Twitter Cards to define your link post preview. Edit your post with an HTML rich text editor to syndicate your posts on blogging networks such as Medium, Tumblr or Bloglovin'. To automatically schedule your posts, you can switch on a ready to use Best Time Scheduler. Or create and save your own best time schedule. Schedule your posts once, multiple times, or recurrently. You can review and edit your scheduled social media posts with an easy drag & drop calendar. Re-share and re-schedule old posts and plan your evergreen content on a regular time scheme. If you want to skip the individual customization you can auto-post and auto-schedule your social media comments to do everything on auto-pilot whenever you publish a post. However, customizing your posts will result in more visibility and engagement with your community. And this can be done in less than 5 minutes for all your social media channels. If you're running a blog or website on WordPress you can use the Blog2Social WordPress dashboard application to set up your social media automation directly from your WordPress Dashboard. When you publish a new blog post, you can use the plugin to schedule and post your content on all your social channels. You can add personalized introductions to your post, plus the option to schedule your post at time slots that work best for each social community. Perhaps you don't have a blog, or you've published other types of content in various locations. For your white papers, ebooks, Slideshare presentations, infographics, podcasts, and videos as well as for curating content from other sources, you can use the Blog2Social WebApp to schedule and customize your content across each social network. It's free to use it for crossposting, cross-promoting, and customizing your posts and there is a Premium upgrade for elaborate social media sharing and scheduling features.